Easy to Use and Easy to Set Medication Reminder for Home or for Travel. Organize all of your daily pills and be reminded with a loud alarm up to 37 times per day. No reset required, re-sets automatically every midnight. Featured on the Dr. Oz Show and in Leading Magazine. Multiple Daily Alarms (up to 37 alarms) - from 6 AM to Midnight. Easy to Hear Alarm (4 kHz tone). Long alarm duration (up to 4 minutes). The perfect medication reminder for home or for travel! This pill timer fits in briefcase, purse or backpack. It is about the size of a TV remote control. 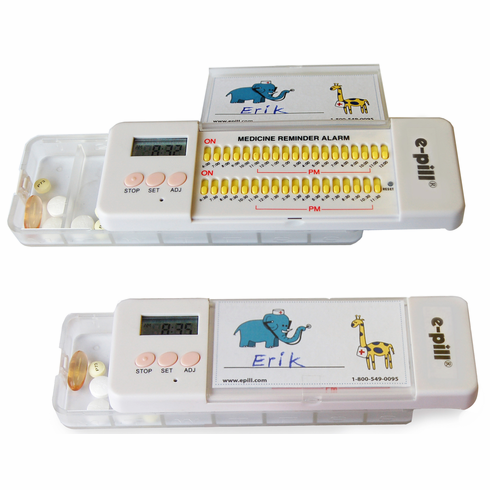 A great simple to set medication adherence device that holds all your pills. Extra trays are available. Simply slide a switch to set the daily repeating alarms! Up to 37 daily auto-repeating alarms starting at 6 in the morning with a switch for every hour and half hour (6AM, 6:30AM, 7AM, 7:30AM and so on) until midnight. Size: 6 1/4" x 2 1/8" x 1". Weight 5 oz.